For quite some years, Delhi has been carrying the championship flag of the most air polluted city in the world. A hidden flag for most of its citizens, who until recently genuinely believed that Beijing’s air pollution is significantly worse. This misconception dwelt in a tremendous lack of general awareness on the air quality in Delhi, as well as in the kind of air pollution prevailing in the city. In fact, Delhi suffers from high concentration of very harmful coarse and fine particles. Particles less than 10 micrometers in diameter (PM) are directly inhaled and accumulated into the respiratory system. Particles less than 2.5 micrometers in diameter (PM) create an even higher health risk: as tiny as 1/30 the width of a human hair, they lodge deeply into the lungs. This is followed by all sorts of deceases and leads to terrifying WHO statistics: 600,000 air pollution related deaths per year in India. Now, comparative OECD data for PM10 ( 2010): 120 micrograms per cubic meter in Beijing versus 140 in Bombay and 280 in Delhi. We might feel the pollution smog less than in Beijing, but we experience it way more. 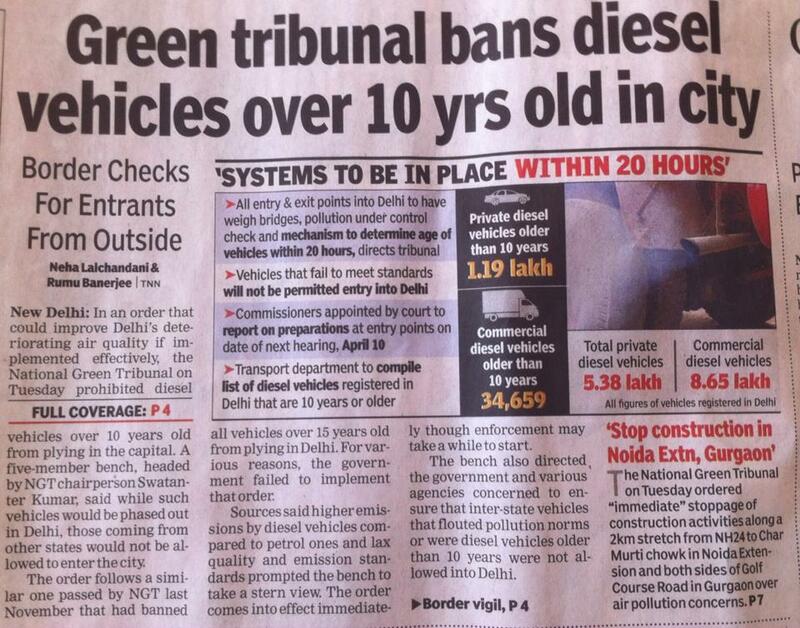 8 April – the National Green Tribunal banned most polluting vehicles from Delhi (see article). Decision was to enter into force in..20 hours! Let’s carry on at this pace – not that implementation challenges won’t come up, but what a step forward! Olga Chepelianskaia is an international sustainability expert and Founder of UNICITI. She specializes on sustainable and climate resilient urban development in Asian cities, natural eco-systems and heritage revival, climate change and clean energy. Over 14 years of her professional engagement, she managed 5 major international programs, covered over 20 cities and 40 countries, and worked with 7 top international institutions: ADB, CDIA, Rockefeller Foundation, UNDP, UNECE, UNEP and UNESCAP. Her expertise covers program management, governance, policy and urban planning, stakeholder engagement, access to finance, valorisation of cultural and natural assets, capacity building, PR and communication. Her focus is on helping Asian cities become vibrant, sustainable, climate resilient, economically dynamic, inclusive and culturally unique. Her brand approach is to place city’s natural and cultural assets at the core of its development to generate unique economic, social and environmental opportunities. She is a speaker and moderator of numerous international events, including recently TEDxFMS (New Delhi), 4th Global Climate Policy Conference (Sao Paulo), Smart Cities Expo (New Delhi), the World Urban Forum 9 (Kuala Lumpur), ICLEI Resilient Cities Asia-Pacific 2017 (Ho Chi Minh), World Bank INSPIRE 2017 (Jaipur), Climate Forum’17 (Moscow), Future Energy Forum 2017 (Astana) or UNDP Asia Forum on the Role of Local and Urban Governments in Building Sustainable and Resilient Cities and Rural Areas (Haiyang).